Unfazed by freezing weather, 45,000 Ohio State University football fans celebrated the Buckeyes' national championship at Ohio Stadium yesterday. The event honored the Buckeyes’ victory in the inaugural College Football Playoff (CFP), a postseason tournament in American college football for the National Collegiate Athletic Association (NCAA) Division I Football Bowl Subdivision (FBS), which started in the 2014–2015 season. Using a 13-member committee to select and seed the participating teams, CFP is different from the Bowl Championship Series (BCS) used by FBS from 1998 to 2013. BCS used computer rankings and coach polls that sometimes, e.g. in the 2003 and 2004 seasons, caused controversy. Never give up. Ohio State Buckeyes was only 16th in the first CFP rankings. However, they managed to bulldozed Wisconsin Badgers 59-0, which allowed them to bypass Texas Christian University (TCU) Horned Frogs and Baylor Bears for a final playoff spot. Then they went ahead to beat the odds by overcoming a 21-6 deficit and upsetting Alabama Crimson Tide with a 42-35 win. In the showdown with No. 2 ranking Oregon Ducks on January 12, 2015 at AT&T Stadium, Arlington, TX, the Buckeyes won decisively 42-20, despite Heisman-winning quarterback Marcus Mariota scored early during their first drive. It is the first national title since 2002 for the Buckeyes. Previously, they did have three BCS championships under their belt. It is also the third national title for coach Urban Meyer who won BCS championships twice when he was the head coach for Florida Gators. 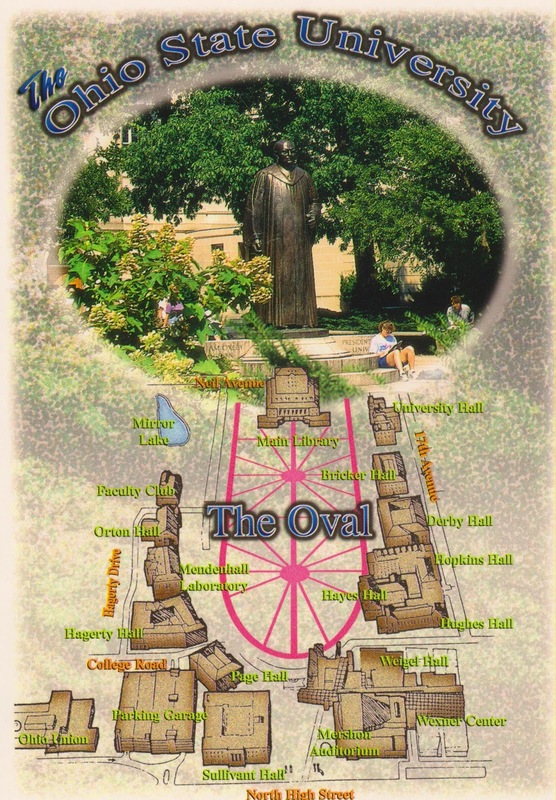 Postcard US-1844593 to the Netherlands shows a map of The Oval at the Ohio State University campus. However, North is on the right side, and West is on top of the postcard. Ohio Stadium, northwest to The Oval, would be on the upper right of the postcard.